Ah, summer. The birds are singing, the sun is shining, and the flowers have bloomed in all their colorful glory. It’s a wonderful time of year. A time when nature sings. A time when the last thing you want is to be stuck indoors. Now, however, it’s spring. 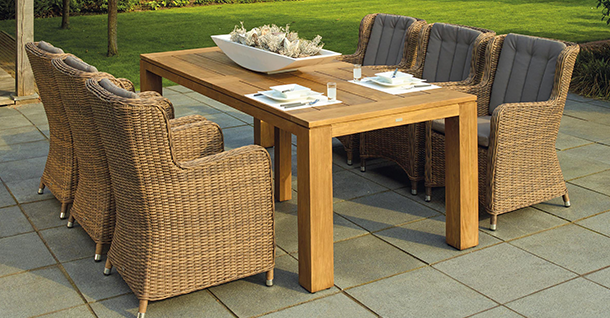 Now is the perfect time to get your patio and deck ready so that you can go out during the summer and enjoy nature. There are several things you need to make sure to do so that you can host the perfect barbecue this summer, or just enjoy dinner in the open air. We’ve got some suggestions on getting your patio or deck ready for summer. Old brick and stone patios tend to become uneven as the ground beneath them gets eroded away by use and rain. This can cause the bricks or stone to stick out at odd angles. Not only is this ugly, but it can be unsafe, causing people you have over to trip and fall. No one wants their Fourth of July barbecue to turn into a trip to the hospital — not to mention the liability issues that could cause. Preventing this from occurring is relatively simple. Though, depending on the state of your patio, it can be a pit of hard work. Pull up the offending stones with a pry bar, clean out the area around it, and set it back down with polymeric sand and a mallet. This stuff is useful because, like normal sand, it makes leveling work fairly easy. However, unlike normal sand, once it rains (or you spray it down with your hose) poly-sand will harden like a mortar, setting the stone down for good. This will make your patio more solid, while also giving it a professional, freshly-laid feel. Depending on how much you had to pull up, it’ll also let you get rid of that pesky moss and weeds which grow in between the bricks and make it much hard for them to grow back. Wooden decks can take a real beating over a harsh winter, and modern stains just don’t seem to weather it like they used too. To really make your backyard look good and prep your patio or deck for summer, you may have to restain or repaint the whole thing. This can be a bit of a process but let me walk you through it. First, you’ll need to scrub down the deck with a stiff brush and a stripping solution. This will help remove any loose paint or stain that could cause problems later on. Be careful here, because the stripping solution can be pretty toxic. Make sure you’ve diluted it enough and try not to use any shoes you’re particularly attached to. After that, give it a thorough spray down with a power washer, which will remove any stubborn flakes of paint and dirt that accumulated over the years. Then you wait. After you’ve waited at least 24 hours for the deck to dry thoroughly, you can start painting and staining. It’s very important that the deck is bone-dry, though. Any moisture that gets trapped under the stain or paint will cause air bubbles to form, if it doesn’t stop the paint from sticking to the deck altogether. This will mean you’ll be right back here next spring, doing the whole process again. You can use a brush and roller to lay the stain down, and it will take a couple days. If you have a sprayer, you can do the whole deck in a few hours. This can be a tempting option, but it takes a certain amount of experience to use a sprayer properly. If you don’t know what you’re doing, you might end up painting your house with your deck stain, and then you have a whole new set of problems. A brush and roller will work fine, and you will be able to use the grill on your newly-painted deck within a day of finishing. If you aren’t comfortable doing the above on your own, consider hiring someone to paint your deck for you. Now that you have your deck and patio done-up to look new and fresh, you don’t want those old, crumbling, wicker chairs to bring the whole vibe of the patio down a notch. You can get some pretty basic wicker furniture at a relatively low cost, and spruce it up with a coat of Rustoleum spray paint. This will give it a nice shine, and you can pick whatever color you want to really liven up the yard. If your furniture is in decent condition, new cushions can pull off the same trick. Natural colors, such as mahogany, greens, whites, and blues can really pull the yard together. Your guests will be raving about how nice your deck looks in comfort, making the process of getting your patio or deck ready for summer worthi it! Or, if you’re selling, your home buyers will begin to imagine themselves calling your place home!